Havant is located in Hampshire in the south of England. The seat was created in 1983 and has been held by the Conservative Party ever since. The current member of parliament is the Conservative Party’s David Willetts who has served since 1992. Being a practical person, I have created my own websites: www.johnperry.org.uk, www.ukiphavant.org.uk and as well as answering all my own emails I also run my own twitter account @john_perry_uk. I am a Havant Councillor and my contact details are here: http://havant.moderngov.co.uk/mgUserInfo.aspx?UID=466 and I can be contacted via any of these means. Havant has been my home and full-time place of work since 1979. THIS IS MY HOME, I care passionately about it and, if elected, I will fight tirelessly to promote the welfare and economy of Havant. I have extensive experience in industry, as a chartered management accountant and professional engineer, and I will use my talents and experience to the full in working for you. These attributes I have would not be possessed by young career politicians with no experience in industry and commerce. The incumbent is influential in the government and has I believe contributed to higher education. However, his trebling of tuition fees is inappropriate especially since only half of student loan debt is scheduled to be paid back, and so fees could be halved with no fiscal impact. While many more students are going to university, it is wrong that our incumbent has allowed for EU students outside the UK going to Scottish Universities to pay no tuition fees whereas English students have to pay £9,000 PA. I do not believe we have had real austerity. The Conservative led Coalition government has doubled the National debt from £800 billion to £1.5 trillion pounds; this is equivalent to an increase in debt of £12,000 per man woman and child. So, if the Conservatives had stabilised the National debt, £12,000 would have been taken from each of us. Our “apparent improvement” in the economy is solely based on credit and not good money management. The Government needs to cut spending £10 billion PA on EU membership fees, £10 billion PA on foreign aid, and £80 billion on the HS2 white elephant for a start. Immigration is good for the UK, but unlimited immigration and 300,000 net per annum arriving each year ( 4 times the Havant electorate) is unsustainable. UKIP would implement an Australian type points based system to give us quality over quantity. The vast influx of unskilled labour is forcing down wage rates through supply/demand and making Britons poorer. The Conservatives pledged to cut immigration from 100,000s to 10,000s, ie to 1/10, but instead they increased it. UKIP would cut immigration to under 50,000 PA. Wage increases for bankers and the professional classes and company directors have been good. Wage increases for our unskilled have been poor or non-existent. To correct this we need to restrict immigration as per question 5. We also need to close the tax loopholes that are being deliberately maintained by the political classes and clamp down hard on tax avoidance and evasion instead of mainly targeting the poor on benefits – we should also repeal the Bedroom Tax. Finally UKIP policy is no tax on the minimum wage. Both the past Labour and Tory Governments have engaged in mass top-down reorganisations of the NHS costing vast amounts of money. Privatisation of the NHS through PFI contracts of £60 billion will cost taxpayers £300 billion to repay. The Conservatives are continuing with mass privatisation taking profits out of the NHS; this must stop. The country must stop being an international health service and compel all migrants and visitors to have compulsory Medical insurance which would have £2 billion a year. UKIP would spend an additional £3 billion on the NHS keeping it free at the point of need and use and cancel car parking charges in hospitals and health centres as they are an unfair tax on the sick. Grammar schools in every own to create opportunities for all, and not just the public school educated, to get into the top universities. Implement no tuition fees for Science, Technology, Engineering and Maths (STEM) and medical school subjects as there is a shortage of those graduates, particularly in Havant. We would also widen apprenticeship opportunities. By restricting unskilled labour immigration, we would open opportunities to Brits to be employed and advance their knowledge and education. Short answer, YES. The political class, the leaders of the Labour, LibDems and Conservatives are all (inherited) millionaires with none of them having performed a job in their lives. How can they claim to represent ordinary people like Havant Residents. This is why we need MPs who have held down a job, and not MPs from the London Set who are out to make a long term career in politics and who also have never held a job in industry. 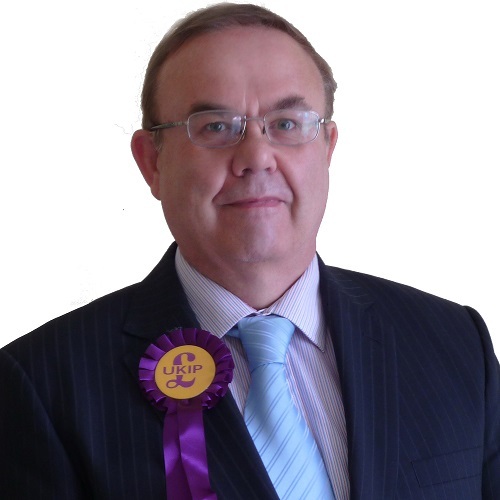 I would vote to leave the EU as it costs Britain £180 billion a year, see http://www.timcongdon4ukip.com/docs/EU2014.pdf I want Britain to leave the customs union and trade with the world. Within the EU, we cannot write our own laws (EU writes 70% of them); we cannot control our borders (450 million EU residents can come here without any barriers) and they can avail themselves of free housing, NHS treatment and public services. In addition we want to regain control of our fish stocks in our waters which currently the EU plunder 70% of them. Tim and his wife Sue live in South Street, Havant in the heart of the constituency. 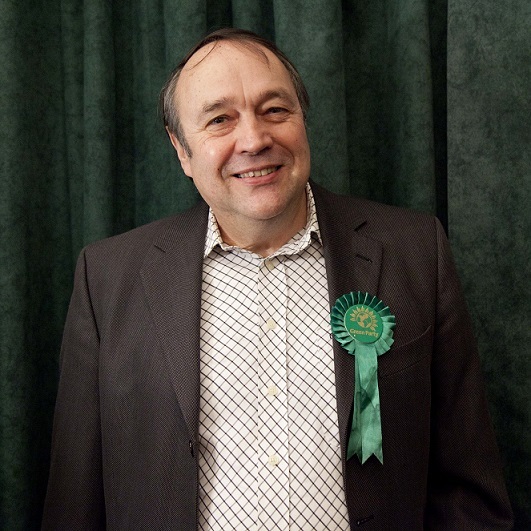 An active local campaigner for the town, on the protection of green spaces and on social justice issues Tim leads a rapidly growing Havant Green Party increasingly seen locally as the only credible alternative to the Conservatives. Tim came second in last year’s local election in his ward, beating the UKIP candidate and leaving Labour and the Lib Dems far behind. Formerly a senior local government officer, he later ran his own successful business and is now retired from paid work – although not from his many community activities. A strong believer in arts for everyone, Tim has organised local art exhibitions, music festivals and is the Director of the popular Havant Literary Festival. Havant Green Party campaigns include holding local councillors to account, arguing for a new rail station at West Leigh and defending the NHS and calling for new community treatment facilities in Emsworth and Hayling. Tim has also been active in the campaign to keep fracking out of Hampshire and West Sussex. I already live in the heart of the constituency and hold – “come and meet me sessions” in cafés and pubs right across the area. As an MP I would hold weekly Friday surgeries and also endeavour to be available by appointment at weekends. If people are unable to leave their homes, I will come to them. My email in-tray is always there and, as anyone who has written to me during the campaign will confirm, I answer all letters and emails personally. I have lived here for 24 years and I am very active, both as a local campaigner and a supporter of many things that go one within the constituency. I have a long experience of public service, as a senior officer and a consultant to local and central government, and I have the knowledge and skills necessary to represent local people effectively. However, it is our Party’s policies that make me, as the Green Party candidate, the person to vote for. Bring rail back into public ownership; stop bashing the poor; make sure the rich pay their fair share of tax; invest in public transport; get serious about fighting climate change; a living wage rather than a minimum wage; half a million new Council houses – these are all policies for the common good. 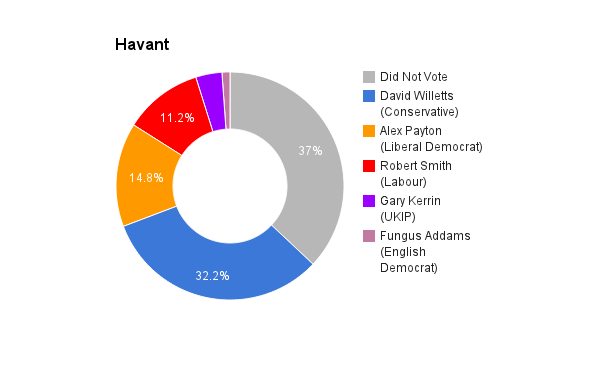 I think Havant has benefited from having a senior politician as our MP. It has made it easier on occasion to raise important personal cases within government, and I believe David Willetts has often been diligent in doing that. He has also been very supportive of the arts in Havant, including the Literary Festival which I direct. That said we have had many disagreements on policy, but as he is retiring, I don’t think is is the time to start raking those over. Well, its working for the Rich. Since the banking crash the 1% have seen their wealth grow extensively, which working people and families have been squeezed horribly and the poor demonised, sanctioned and driven to using food banks to survive. Rents are up, benefits are down and have been made horribly insecure. The level of economic debate has been reduced to a childish name-calling between Labour and Conservative. The fact is that it’s the same people we bailed out with billions of borrowed bonds that created the debt by lending it to the government. The level of the debt the UK is currently carrying is less than it was, as a proportion of GDP, for most of the last century. Austerity has stopped the growth in the real economy – manufacturing and public infrastructure provision in particular – and in the end weaken us ahead of any future recession. We need to develop a new and much better informed economic literary amongst our citizens so people can’t be just sweep up with demagogic economic prattling designed to mask a sinister agenda to protect the super rich, enable unfettered exploitation and reduce the services provided by the state. Fundamentally immigration should be about the rights of people to move around and live where they want to. We don’t seem to have much of an issue about English people choosing to live in Spain or France. Some people need to come here to be with family or those they love. What is wrong with that? I do think that this country, especially the South, is very over crowded and that means pressures on those of us luckily enough to live here and especially on our countryside. It is particularly worrying that we have become a nation that no longer goes enough to feed more than half our population. So yes there does have to be controls on immigration, but the primary concern should be the welfare of those that want to come here and not how much money they have managed to make from exploiting people in their own countries. Certainly it is vital for the health and well-being of our community that as far as is practical people are allowed to travel here and we to travel where we want to go. Stop privatising public services for a start. A huge part of utility and transport costs are down to privatisation. We would take the railways back into 100% public ownership and cut fairs immediately. The Green would concentrate on bring up the standards of the poorest in our society. So pensions would rise very significantly as would most benefits. We would make the Minimum Wage a Living Wage, raising it to £10 an hour by the end of this parliament. It has to be fully funding – with funding levels matching the large increase in the number of patients. We would fund these increases from general taxation, increasing tax takes from the top 5% of earners and re-introducing a Wealth Tax pitched at 2% per annum for personal wealth over £3m. We would seek to have many more community hospital facilities, typically integrated with GP surgeries to save on equipment costs and things like reception and other service costs. In some areas these would also provide smal injuries and other A&E type services over extended hours of service – taking some of the pressure of major hospital A&E departments. A major paradigm shift is needed in investment and industry support taking us back to manufacturing and high quality service and maintenance standards. It’s no good talking about creating more apprenticeships if the real jobs are not there for trained skilled people to do. Greens would create a million new real jobs in a national campaign for a shift to renewable energy and energy savings and a further many hundred thousands of jobs in the construction industry building new council house and public infrastructure projects. These are real skilled and semi-skilled jobs offering the prospect of long-term meaningful employment creating socially useful value. Yes. We have the best gender balance of any of the parties in our elected representatives and candidates and we are starting to do more on encouraging more BME candidates. But we need to do more. There is a lot that needs to change in the way parliament works to encourage more women and those who aren’t from white upper-middle class backgrounds to get involved in Westminster politics. It depends upon the situation at the time. I voted “No” last time. I would like to see more power at the local level, not just devolved to UK government but further down as well, to councils and communities. St present other organisations like the NATO and WTO as well as treaties like TTIP actually pose a much greater threat to UK sovereignty than the European Union. These organisations have no level of democratic control. Even with its limited powers the European Parliament does a pretty good job. So I don’t rule our campaigning for an OUT vote if things with the EU get any worse. My feeling is, though, that is not what is happening and the over-centralisation of Europe is beginning to roll back, in which case I would most likely encourage people to vote IN.